This control unit for installation by electricians allow you to easily gain full control over the heating and security in your cabin through your mobile phone. DEFA Base Unit PRO is the ideal solution for fuse box installation by professional installers, gaining you full control over the heating and security in your cabin via mobile phone. What is the benefit of using DEFA Cabin Control? All control possibilities are neatly organized in our DEFA app for your smartphone or through our web interface for desktop users. You remote control, monitor and set all settings for remote controlling your cabin. Through our interface you simply have full control. It is simple to use the 3 integrated zones for any remote control purpose. You can expand with an additional 3 zones through Base Unit PRO Ext or expand with wireless wall sockets, temperature sensors and alarm sensors through the use of Radio Module PRO. A backup battery is included as standard, enabling you to be alerted if a power outage occurs. Using our sensors you will be alerted of any break in or low temperatures, so you can take appropriate action. Base Unit PRO supports wireless control with the addition of the expansion module Radio Module PRO. To enable use of wireless sensors you must install and connect this module to your Base Unit PRO. 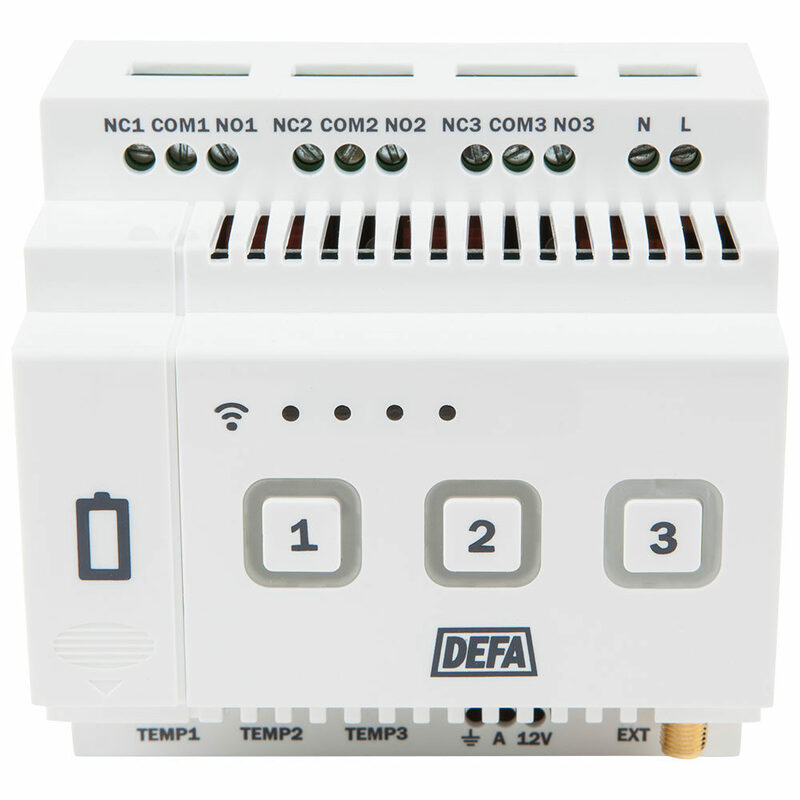 All wireless DEFA Cabin Control accessories can be connected to your system, including temperature sensors, sockets and alarm sensors. Installing an alarm with DEFA Base Unit PRO is easy. Our Magnet and Motion sensors ensures that you are alerted in event of any intruder, so that you may contact the police and your insurance company to limit any damage done. With Base Unit PRO you can also connect an existing cabled alarm system to the integrated cabled alarm input. See the user and installation manual for more information. The product must only be mounted by a certified installer in a certified fuse box. Ensure that the installation is done by a certified installer. Mount Base Unit PRO on the DIN rail in the fuse box. Connect extension cables to Base Unit PRO Ext or Radio module, depending on which is mounted. Connect the GSM antenna and place the GSM antenna outside of the fuse box to prevent mobile signal disturbances. The product is now ready for use.